Welcome! We encourage you to explore our website and email us with any comments or suggestions. Stay in the know! Click here for the Official Word. Sign up for the City Clerk ListServ (for City Clerk professionals only). 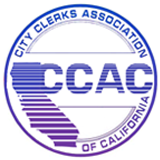 The City Clerks Association of California (CCAC) was founded in 1977 with a mission of promoting the profession of City Clerks through education, support and communication. As a member, you will receive reduced registration fees for training opportunities, access to scholarships and a network of municipal clerk professional statewide.